A very popular stop-by for migrating birds, especially Flamingos. 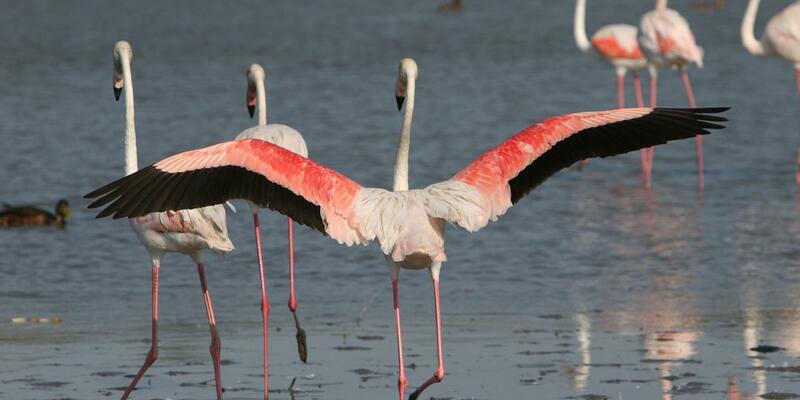 You will not miss them: the flamingos are literally everywhere around Saintes-Maries-de-la-mer and over the Camargue on swamps and lakes. This intriguing birds, feeding only on small insects and shrimps, end up taking the color of the food the animals they eat, explaining their pinky color! Several observational spots can be found over the Camargue region and near our village. An area of permanent experimentation: Several experiments, including some regarding the regulation of the mosquito population are conducted with success in the Camargue region every year. A land of agriculture and farming: Our Camargue natural park economy relies mainly on farming, agriculture and tourism. Camargue is well known for horse and stier breeding (called “manade”). They’re a pillar of our identity and are regularly celebrated during festivals throughout the summer. You’ll be able to take the real feel of Camargue in Saintes-Maries-de-la-Mer, enjoying a tasty stier steak at one of our village restaurants. Stiers and horses from our region are from a breed which isn’t found anywhere else. This vast wet region allows the culture of rice (“riziculture”) and salt! Out famous “marées salants” can be seen from Aigues-mortes (near Montpellier) to Arles and Saintes-Maries-de-la-Mer. An area of touristic interest: The whole point of Camargue’s natural park existence is to find a way to combine developement and preservation of the environment. The unique aspect of the Camargue region and the natural park prevent the uncontrolled and dangerous development of tourist infrastructures seen in other villages along the côte d’azur. See you soon in our hotel in Saintes Maries de la mer, heart of Camargue!